The day everyone has been waiting for finally arrived: The first day of the 26th World Championships in Acrobatic Gymnasts! The gymnasts brought their first, and some of them even their second exercise. In the morning session we’ve seen the competition on Women’s Groups and Men’s Pairs. For many gymnasts this session did not go as planned, we’ve seen some falls and quite a few wobbles. The morning session was launched by the performance of the Polish Women’s Group. Emilia Plewnia, Marta Srutwa and Magda Rajtor performed a clean routine and got a solid score of 26.590 and are currently in the 8th position. The defending World Champions and World Games champions, Russian trio of Daria, Polina and Kseniia are currently first with a solid advantage of 0.5 over Belarus. Their difficulty packed routine has got the highest difficulty value in the whole WG competition – massive 2.040! Even a penalty of 0.3 couldn’t harm their lead! Belarus who opened their routine with a fantastically landed triple back is now second with a high score of 28.090. In third place there is the Chinese trio. Girls performed a lively routine to the sounds of big band and fantastically landed most of their elements. The Chinese team is followed by Ukraine, who in comparison to the leaders presented a routine with a relatively low difficulty score; however, thanks to a clean execution and a good artistry score, the girls finished the first round of qualifiers in the 4th position. Israel finished 5th and once again charmed the hall with great artistry and a nice floor flow. Home country’s trio with identical twins Anna and Eva are currently in the 7th position. Some countries had a double representation in the Women’s Group events. We’ve seen two strong Dutch trios - Suzanne, Charell and Lisanne are currently 11th and Mariska, Pleunie and Fem have placed 6th after their first routine. Both groups had good performances so we are looking forward to seeing more from them in the afternoon. Germany also had two groups competing in the morning round. The trio currently in the 12th position, Anna, Alina and Annalena, also competed in the World Games last summer, where they finished 5th overall. Australia, who surprised us in the 13-19 competition also entered this category with two trios. The second group with Sarah, Jillian and Madeline had a fall in their first element and even though they quickly got back on track, they are currently in the back end of the ranking. The Spanish group also had a fall in one of their dynamic elements. Just as we thought they were about the fall again, the bases brilliantly saved the top and the girls could continue. The British trio also did not have the competition they were hoping for. A couple of mistakes by landings and although they didn’t get any penalties, a low execution score 13.700 currently placed them in the last place of the ranking. In this event we’ve also seen the only representatives of Austria - Florentina, Melanie and Victoria did a solid routine and despite a relatively low difficulty (0.94) they are currently in the 15th place. Will Austria be the surprise of today and manage to get a spot in the finals? The US girls presented a very promising, energetic routine with a strong triple back, however the top landed on her knees and the team is currently in the 13th position, they are definitely the team to keep track on in the afternoon, as it wouldn’t be the first time in this competition series, when the USA managed to surprise the crowd. The Men’s Pair event, kickstarted by a Kazakh pair, was as well quite unlucky for some performers. As a second performance we’ve seen the defending World Champions Nikolay and Igor, who unfortunately made a mistake in the first element which cost them 0.3 penalty and a finish in the 4th position after the first round. The current leaders of the Men’s Pair ranking are the World Games Champions, Germany’s Tim and Michail with 28.675. They also had a small mishap and been given a penalty of 0.3 which didn’t threaten their lead. Next in line is the pair from the Democratic People’s Republic of Korea. Their graceful routine with a jaw-dropping difficulty value of 2.590 scored them 28.190 which put them 0.485 behind the German pair. In the third place there is the Men’s Pair from Great Britain – Adam Upcott and Charlie Tate. They performed a clean routine and are currently 0.01 behind the Korean pair. 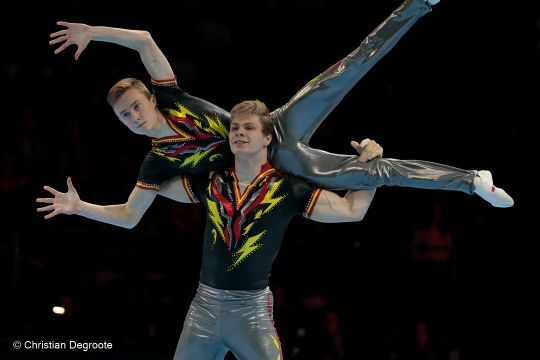 The other GBR pair with Michael and Jake did not have the performance they were hoping for. With 1.500 penalty they are currently closing the Men’s Pairs ranks. In the 5th position there is the Chinese pair – very experienced players who also presented an impressive routine with 2.250 difficulty value. As opposed to the majority of the routines we’ve seen in this session, Poland has presented a merry routine to a music medley. The clean execution put them in the 8th position after Belarus and Kazakhstan respectively, who despite of their relatively low execution scores (16.900 and 16.600) thanks to no penalties and difficulty over 2.000, finished 6th and 7th. Sadly for the Belgian pair, their performance also did not go as planned. They made 2 mistakes and finally scored 24.930 being awarded a penalty of 1.2 and are currently in the 11th place. Following the exciting morning session of Women’s Groups and Men’s Pairs, the second session featured the Women’s Pairs, Mixed Pairs and the crowd favourites – Men’s Groups. In the Women’s Pairs event only 9 teams are competing for a qualifying spot to the final round, which means there will be only 6 places in the finals. An unlucky turn of events and some costly mistakes in the performance of the defending champions were a big surprise. The big threat to double Daria’s dominance in the Women’s group category are Elena and Ksenia, who also represent Russia and are now in the lead over the current champions. Obviously this can still change in the second qualifier. After the balance routine the Pair from Israel wasn’t going to leave their leading position. Bronze medallists of the European Championships absolutely mesmerised the audience and scored 29.015. Once again Israel proved that artistry is their massive asset. Again it was Korea who performed a routine with the highest difficulty value in that round. 2.320 and a clean routine was enough to win them the 3rd place. In the Mixed Pair event the long-lasting Russian dominance after the first qualifier remained unchanged. Marina Chernova and Georgii Pataraia scored 30.410! A flying difficulty of 3.060, a good artistry score and the highest execution marks in their category. The double front pike followed immediately by a triple back are performed so effortlessly it is unbelievable. We can’t wait to see what tricks they’ve got up their sleeve for their balance routine tomorrow. In second place, quite unexpectedly is the Mixed Pair from Azerbaijan. In the European Championships in Rzeszow (POL) they finished 3rd in the Dynamic final in the 13-19 age group. Now 28.390 (after 0.5 deduction as well!) in their first year as a senior? Not bad at all! Belgiums Marte and Bram scored solid 27.560 and if they keep up the good work tomorrow, there are good chances we will see them in the final, which is truly desired by the home crowd here in Antwerp. In the Men’s Group event we’ve witnessed some chilling scenes. The Belgian group who opened the event with their really innovative choreography, unfortunately fell in their first balance combination. Suffering 0.9 penalty, they are currently ranked 8th out of 9. In this event as well, we will only see 6 formations in the final. Tomorrow they will get another shot at the qualifying spot. We would love to see more of their routines, as their choreographies are a true breeze of fresh air in the Men’s Group event. The men’s group from Ukraine also did not hold the first element. After the base’s dramatic fights to stay stable, they gave in and landed. A 0.1 deduction and 15.800 execution score currently placed them in the 7th position. In the 6th position there is the Men’s Group from Germany, almost a point behind the Russian Group. The other Russian Group did also not have the performance they wished for and are currently closing the rankings. The 4th place was again a surprise. The Men’s Group from Portugal, who in the recent European Age Group Competition competed in the 12-18 Age Group and were silver medallists thereof. The group performed their balances very confidently, without any mistakes! Israel finished the first day of qualifiers in the 3rd position. The bronze medallists of the World Games delivered a wonderful performance and scored amazing 29.720. With no surprise to anyone they demonstrated fantastic artistry and have been awarded a 9.500 artistry mark. Such a high score for artistry is not a common occurrence in the Men’s Group category! Finally in the first two places there are the groups from China. Both with difficulty values over 3.000 performed steadily, without any mishaps and finished in the lead. The defending World Champions scored 30.440 which is the highest score of the day across all categories. The lead in the Women’s Groups category remained the same. The World Games Champions from Russia are followed by the World Games silver medallists from Belarus. Both teams performed steady balance elements with impressive skills and managed to stay in the lead. The group from Israel managed to catch up and moved their way up from the 5th place to the 3rd position. They are however almost 2 points behind the leaders. Will they manage to catch up with their combined routine? The Belgian group has also made and impressive move up in the standings. 7th after the tempo routine they finished the day ranked 4th losing 0.6 to Israel. The difference between teams from the Netherlands is getting smaller. 6th and 11th after the first round now are in the 5th and 8th position. Both teams proved that balance skills are their big asset. After their third routine tomorrow we will know who we’ll see in the finals on Sunday. The Chinese trio also amazed the hall with their balance skills doing element after element, however they had a minor mistake in their routine that harmed their overall ranking. Today Portugal once again proved that they are a strong player. The trio danced their way up in the 7th place overall with their Chicago soundtrack routine with some creative skills. It is hard to predict anything before tomorrow’s final round of qualifications where everyone will perform their combined routine, so let’s just wait and see. Tomorrow we will know the finalists! After the unfortunate morning for the Men’s Pair’s the second round of qualifiers was definitely much better. Germany is still in the lead, however Russia managed to minimalize their disadvantage and now is in the 2nd place only 0.11 behind Germany. The British Pair with Adam Upcott and Charlie Tate are still in the 3rd place . They scored a bit less for their tempo routine (27.590), less then Belarus, who is currently in the 4th place with (27.975), but the fact that Belarus had a shaky start to their Balance routine, where the British pair managed to get a solid advantage, kept them in the 3rd place overall. The boys from Kazakhstan scored 28.010 with their very entertaining routine and are currently in the 7th place. Finally in the 8th place are the Home Nation’s representatives – Robin and Kilian. After an unfortunate morning, in for their second routine they scored 28.470, which was the second highest score for a tempo routine in the Men’s Pairs. Their Harry Potter theme routine got them amazing support from the audience. If they keep up the good work tomorrow and qualify for the finals, the leaders will have a strong competition! After an amazing competition today, we are now waiting for the final qualifying routine tomorrow and when we will finally know who are the finalists of this 26th Acrobatic World Championships!